WeChat, which is a Chinese Voice and Text messaging App, has now announced increase in its international user base to over 100 million users which makes it the 5th most downloaded smartphone app worldwide. WeChat has doubled its user base in last 3 months owing to WeChat 5.0 Upgrade and attractive marketing campaigns. “We must thank all our fans for helping us achieving 100 million registered user account milestone in such a short space of time. To those people, and to future users, we promise we will continue to bring you innovation, for example we launched the first-of-its-kind voice messaging service ‘Hold-to-Talk’ on the app in 2011, and we will continue to develop and enrich our user experience. Whether users want to create text message, share moments, or engage in live audio and video chats, WeChat has made it all available to enjoy securely and for free,” said Poshu Yeung, Vice President of International Business Group at Tencent, the company behind WeChat App. WeChat has gained tremendous popularity in Asian Markets including India, where there is a Widespread craze for messaging Apps among youth. 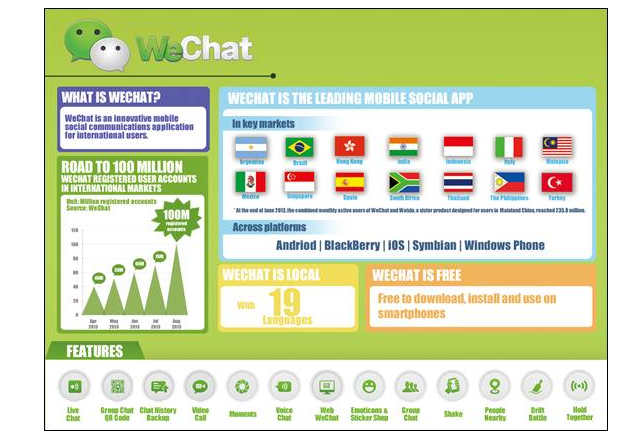 WeChat also became the most downloaded mobile social in international markets like Argentina, Brazil, Italy, Mexico, Philippines, Singapore, Spain, South Africa, Thailand and Turkey in July 2013. Panasonic few weeks back announced it tie up with WeChat. Many other big brands like Café Coffee Day, Big Bazaar, PVR Cinemas etc. Have been using this platform to interact and communicate with their customers. The presence of WeChat in Emerging markets like India will only increase in coming months. You can Install WeChat for free for various platforms including Android, BlackBerry, iOS, Symbian and Windows Phone operating systems from App stores.